So today, Thy Fearful Symmetry reached the number 2 spot in the free horror bestseller list on Amazon, and ended up number 66 in all categories. I’m a bit embarrassed about it, to be honest with you. I really didn’t mean it to. Some context first. Last month, I dropped the price of Thy Fearful Symmetry to zero for a three day stretch. I’ve blogged before about how annoying I find authors who abuse social media to shout about their books twenty-four hours a day, and decided not to do the same. I wrote a blog in which I announced it. I tweeted a couple of times, and posted a link in Facebook, both on my own page and a couple of horror reading groups where self-pimping is all the rage (to the point of no discussion at all happening – a lot of authors are trying to sell their books to a lot of authors who are trying to sell their books to them). The book was downloaded 464 times in the US, 99 times in the UK, and seventeen times in Germany*. I was really pleased with that, particularly as I wasn’t directly responsible for most of those. You were – those of you who tweeted the link, or shared it on Facebook, or who just told a friend it was there. So, that was August. Last week saw Thy Fearful Symmetry’s first ‘proper’ book review, at the Hopelessly Devoted Bibliophile site. Jessica, whose cyber-home it is, really liked the book. She also asked if I’d like to do a follow up guest-blog for her readers. She’s that kind of lady – when she enjoys something, she wants other people to know about it too. I wrote the guest-blog about faith, love, and the end of the world. I also told Jessica I’d set the price of the book to zero again for the day, and that we’d keep the announcement to her blog. A sort of surprise for anybody checking out the review on the day it was posted, and a thank you to Jennifer for being the first. Initially, everything went as expected. A few downloads when I checked at lunch time (the free period started at midnight, Pacific Standard Time, so it was the afternoon here in India before it started). A few more in the early evening. Maybe thirty, in total. Around about ten at night here, I checked the downloads. They’d doubled. I refreshed the page a few minutes later, a bit confused about the surge, and the number shot up to two hundred. This was a clue that something had changed. Pixel of Ink is a massively popular free ebook listing site. Every day, they highlight a handful of books that are free on Kindle at that moment. They’ve got standards (they won’t promote stuff that looks substandard), and nobody is guaranteed to be featured. Although you can submit your book to appear on the day of a promotion, you really need to do it some days or weeks in advance, and in the knowledge that there are dozens and dozens of other authors hoping their work grabs the site’s collective eye instead of yours. The site is checked out regularly, by thousands of eager readers looking for something new to read. It’s premium space for this sort of thing, and an excellent and trusted resource. A few minutes before I noted my numbers beginning to rise, they’d posted Thy Fearful Symmetry as one of the afternoon’s featured books. I hadn’t even told them about it. When I went to bed a couple of hours later, the book was closing on 600 downloads. 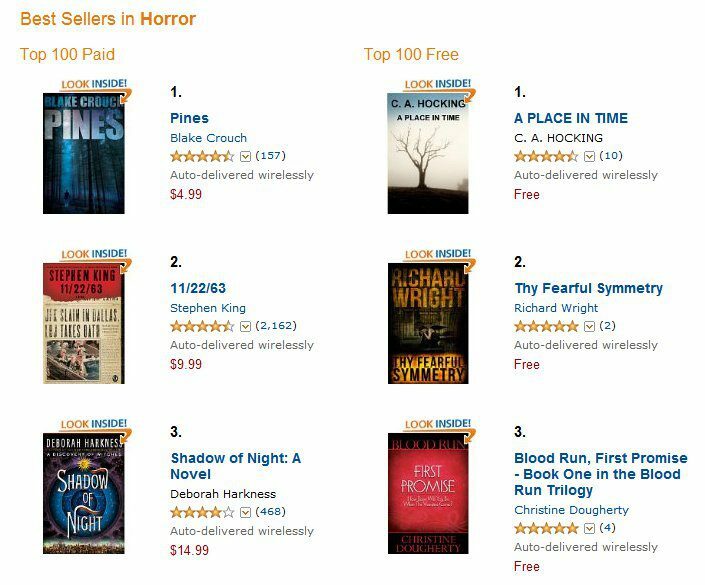 Twelve hours later, as the book went back to full price, it was number 2 on the horror bestseller list (and 66 in all categories), and had been downloaded 3665 times in the US. That’s a big number, for a single day. What I think happened is that somebody at Pixel of Ink read Jessica’s review and my guest blog. They liked the look of it, were reassured by the review that it was worth promoting, and decided to make it one of the featured books. Everything else happened on its own. It’s a prime example of being in the right place at the right time. I helped it happen in only two ways. I wrote a book that one person really enjoyed (Jessica). She shared her enthusiasm. I made sure I paid good money for a great cover from a professional cover designer. Readers browsing sites such as POI make very quick decisions about what they want to download – and there’s a lot on offer. A glance at the cover, a skim of the blurb, and they’ll either click through or move on. If the cover didn’t arrest the attention, nobody would even have bothered with the blurb. When they did click through to the Amazon book page, the first review they would have seen there is Jessica’s, which she copied from her own site last week. Below that, the ones you left. A handful of confidence, to make clicking the download button that bit more worthwhile. And that’s it. How to be a bestseller, albeit briefly, in just a couple of steps. Whether a day of very high visibility makes any long term difference to how the book does is yet to be seen, but I’m not worried about it. This was all just a happy confluence of stuff, that means more people might read the story I wrote than would have before. Thanks again to Jessica, for getting the ball rolling. The exclusivity thing didn’t quite go to plan, but I love that this happened in such an non-engineered way. *nothing at all in France, Italy, or Spain, where the book’s also available – I appear to have a tiny German fanbase**. **Not of tiny Germans, of course***. A fanbase that’s tiny, based in Germany. ***actually, I don’t know if that’s true. I like the idea of a fanbase comprised solely of tiny Germans. A lot. That’s what I want for xmas. I shall drop hints to my wife. Craven Place – Spooky Mystery Sale!